IISD Reporting Services (IISD RS) has produced a summary report from this Workshop. To download it, click the HTML or PDF icons below. 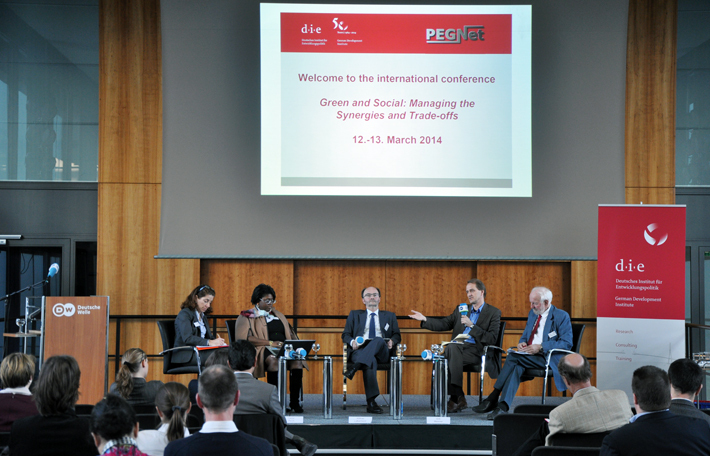 The International Workshop “Green and Social: Managing Synergies and Trade-offs” was held from 12-14 March 2014, in Bonn, Germany. The workshop was organized by the German Development Institute (DIE) and the Poverty Reduction, Equity and Growth Network (PEGNet) to explore how existing development pathways can be transformed to become both more environmentally sustainable and more socially inclusive. It brought together researchers and practitioners from the environmental and social inclusion communities to discuss how to bridge the gap between the social and environmental perspectives of development. The first two days of the workshop featured a series of paper presentations, keynote speeches and panel discussions. On the third day, an invitation-only dialogue was held with about 50 researchers, civil society representatives, government officials and representatives of international organizations who came together to discuss how possible trade-offs may be addressed in the design of the post-2015 development agenda. Download the IISD RS summary of this workshop in HTML and PDF format.